Ping Pong Map is a nicely designed map for sharing the locations of table tennis tables. Currently the site has mapped the locations of a lot of tables in the USA Germany, Switzerland, Sweden and France. Users can add tables to the map by filling in a short form. 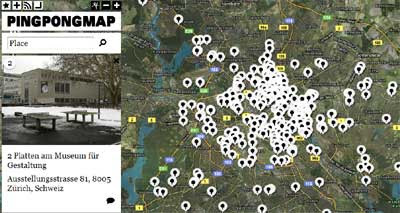 Ping Pong Map is from the same Google Maps designer as the Berlin Tennis Map, which uses Google Maps to show the location of tennis courts in the German capital.